You are here: Home / Blog / Why do slugs come into my house? Maybe that’s why they want to go in mine? I honestly can’t think of anything more disgusting than standing on a slug with bare feet in the middle of the night.Actually picking one up to get rid of it also gives me the creeps. For the last month or so there have been slug trails on the lounge floor, on the couch, stairs, my flip-flops and even on the babies car seat. As we have been up quite late the last few nights, we have spotted the little bugger and it really does appear to be the same one. I am too much of a wuss to pick it up and chuck it out but husband has once or twice. But the persistent, slimy, snail without a shell just keeps coming back. It really could be the same one as slugs leave their own individual scent trail so they can find their way home. Apparently one of the reasons slugs may venture into the house (particularly an old house) is because they are likely to be cool, dark and moist so if you have a damp problem that could be one reason. Another is pet food. 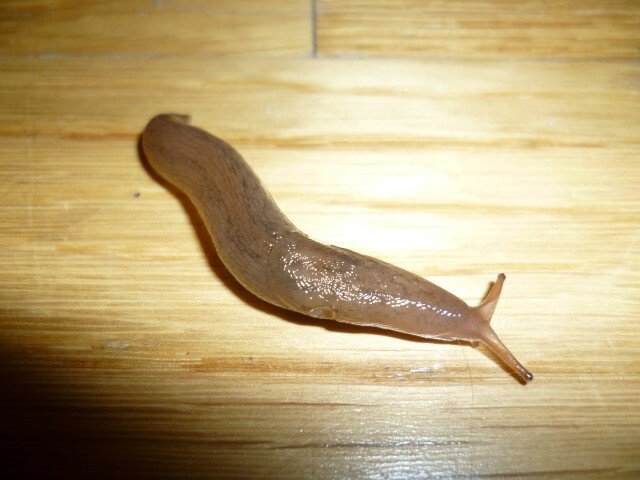 Slugs have a great sense of smell so will make a beeline for it especially if it’s a rainy night. Or they could be after some plants you have placed artfully in your living space. Well, we don’t have any animals, I haven’t seen them anywhere near the window sill which is where I have 2 herb pots and as far as I’m aware we don’t have a damp problem. I do know however that the front door does not fit very well at all and because slugs have no bones, they can stretch up to 20 times their normal length which enables them to squeeze through the tiniest gaps. These facts lead me to deduce that the poor thing just wants to be cooled down after the lovely warm weather we have been having lately. But that doesn’t really make sense as only 5% of the slug population is above ground at any one time. The rest is apparently underground doing things that slugs do like eating seedlings, laying eggs, and feeding on roots and seed sprouts. I would have thought that would be much more appealing than my house. Eggshell experiment. The ones in the eggshell were even more appealing than the ones that weren’t. 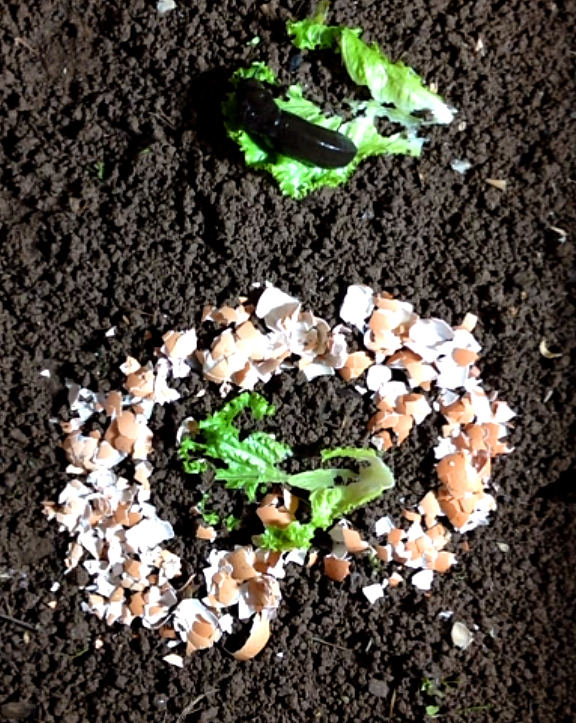 Crushed up eggshells – a common suggestion which apparently is totally useless and untrue as this picture from an experiment shows. The snails actually were attracted to the shells with some egg residue on them and the sharpness of the shells on their bellies was no bother. Kind of glad this one doesn’t work as eggshells around the house may be even more disturbing than the slug trails! 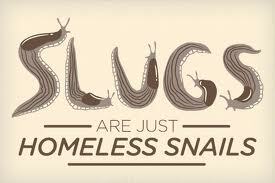 Unbelievably, in my trawl on the internet this morning for information about how to get rid of slugs and why they want to party in my house, I found not one but two brilliantly informative websites totally dedicated to slugs! ”Slug off!” has some truly bizarre facts about slugs. My favourite one is that a slug has approximately 27 000 teeth which is more than a shark and that, like sharks, they routinely lose and replace their teeth. ‘All About Slugs’ even has Slugapalooza – a page totally dedicated to poetry and stories about slugs for a totally random 5 minutes of your life! How do you cope with unwanted slugs in your garden and home? I’d especially like to know if you’ve ever fed your chickens slugs that have been soaked in beer?? P.S. This post contains affiliate links which means that if you buy something through my link, Gumby Legacy gets a tiny commission on it. Doesn’t cost you any extra & helps us help others so much appreciated! When I find the buggers I wrap then in tissue paper and send them down the loo!! Can they swim as my Mum reckons they are all coming back via the loo. Almost put my hand on one this morning! It was atop the bedside table and one was on its way up a leg. They appeared to be trying to colour themselves to the bamboo of the table. How do you make a beer trap? I have a very old house with a crawl space and old wooden floors. They come in and go straight towards the dog food. I noticed where they were coming in and put a little salt there. No more slugs for now! I have lived in my current home for over four years. The home is built on a crawl space. I’ve never even seen any bugs, save for the occasional fly, in the entire four years, that is, until tonight. After googling a “slimey thing with antennas”, I pretty much figured that I was in the company of a slug. Long story short, I wrapped him up in paper towels and looking like a slug mummy, out the back door he went. Your great advice will hopefully keep him and his kin folks away. Slug mummy! love it Janis 🙂 thanks for taking the time to comment and I hope he doesn’t keep making his way back in! Wow thank you for the very informative post. I was in the garage and noticed a snail. Like you, I don’t want no party in my house. What a funny picture of your slug resident . Mine is also staying unfortunately but now I know a lot more about slugs. I am very appreciative of your written work. P.s.was yours really necessary? Is it not TMI? Does the reader need a disclaimer? P.p.s. I can’t wait to get lost in your blog for hours.